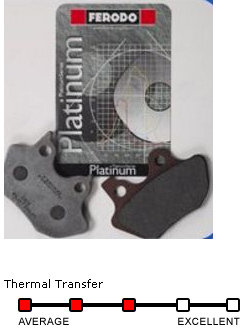 The Platinum organic compound is also the dominant material used extensively in both MotoGP and World Superbike as “the” rear brake pad due to its incredible feedback and added control it delivers at the pedal. AHRMA Vintage class roadracing is yet another venue where the Platinum organic provides an optimal blend of power and control for a large cross-section of these classic series race bikes. To find the correct application for your bike, please use the link below to download the Ferodo North American Brake Pad Application Guide, or use our contact form, and we will get back to you ASAP!